New information on the murder of antiabortion activist James Pouillon suggests that both killer and victim may have had personal motivation. Many details about Pouillon's alleged murderer — truck driver Harlan Drake, age 33 — remain shadowy, but police now know he planned to kill another man on his shooting spree, Owosso realtor James Howe. Because a witness outside Owosso High School got Drake's license plate number, the police were able to stop him before he got to Howe. The Detroit Free Press reported that Drake had not given a motive for his targeting of Howe or gravel pit owner Mike Fuoss, but that he was the son of one of Fuoss's former employees. And a source familiar with Owosso and with the case told us that Drake was angry over a "business deal gone bad" between his mother, Fuoss, and Howe. For now, Shiawassee County Prosecutor Randy Colbry says only that Drake's murderous plans "stemmed from individual grievances Drake had with the victims." He adds that Drake "had a grudge, if you will, against these three individuals," and that in the case of the anti-abortion activist, "the defendant was offended by the manner of Mr. Pouillon's message." The picture that's emerging, then, is of a man with personal vendettas — against two men with whom his family may have done business, and a third man whose "manner" rubbed him the wrong way. Drake wasn't an abortion-rights crusader — he was an angry man who, according to Colbry, "thought the protester's display of graphic abortion photos outside the school was inappropriate." His unconscionable crimes seem less motivated by support for reproductive choice and more by his reaction to Pouillon's tactics — and, perhaps most importantly, by his personal disappointments, whatever they were. Interestingly, some who knew Pouillon say his protests were personally motivated as well. His nephew Steven Pouillon told the Times that James Pouillon's divorce over ten years ago "triggered" his protesting. "He got heavy into it after that," said Stephen Pouillon. 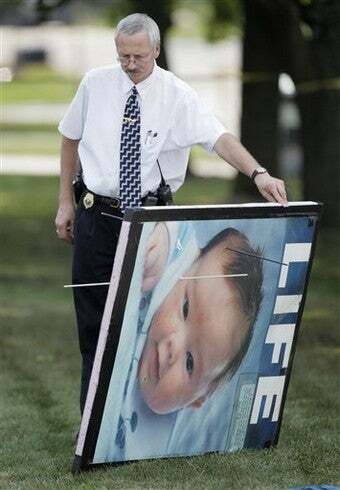 And Owosso resident Jimmy Carmody said, "I really don't think he hated abortion as much as he was bitter about the marriage." Of course, Drake probably wouldn't have turned a gun on Pouillon if he wholeheartedly agreed with Pouillon's views — just as Pouillon wouldn't have protested day after day if he didn't believe in his cause. And it's important to remember, as President Obama said, that "whichever side of a public debate you're on, violence is never the right answer." Nonetheless, this tragic chapter in the "public debate" on abortion has private, personal underpinnings as well — and while they may not explain everything, they shouldn't be ignored.